Learn more about our Learn-to-Skate classes! Learn more about booking your birthday party at the coolest place in town! Find out more about our Adult Hockey leagues! Welcome to the Greensboro Ice House! The Greensboro Ice House opened in the fall of 1997. We are located near the Wendover Avenue exit off of I-40. We are a multipurpose organization open year round that offers skating to the public, youth and adult hockey, learn to skate classes, figure skating, birthday parties, day camps, group outings, broomball, and private rentals. Our facility is equipped with rental skates, a concession stand, four locker rooms with showers, a women’s locker room, two multipurpose birthday party rooms, a mezzanine viewing area, and pro shop with skate sharpening. Our staff is excited to serve you! We are the home of Greensboro Youth Hockey Association‘s Stars, who offers learn to play hockey and house leagues; Triad Hockey Alliance a joint venture between Greensboro Youth Hockey and Winston Salem Youth Hockey provides travel leagues for our youth. We are also the home of Summit Figure Skating Club. SPRING Learn to Figure Skate and Learn to Hockey Skate classes begin Tuesday, March 5th and Saturday, March 9th. Classes open to beginner and advanced skaters ages 4 and up! 30 minute weekly class includes skate rental PLUS class card with FREE public skating admission! Late enrollment accepted with remaining classes prorated. The most urgent information about our business will be found in this box. 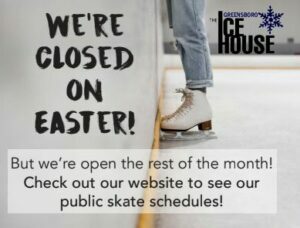 The “Greensboro Ice House Bulletin Board” is the place to check for cancelled sessions, emergency closings due to weather and any other important information we think you need to know right away! So check back often, and we will do our very best to keep you informed!